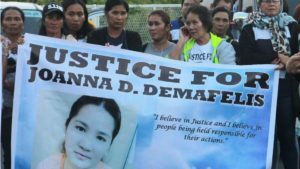 A court handed death penalty by hanging to the Lebanese and Syrian spouses, found guilty of the death of 29-year old Filipina house worker Joanna Demafelis. The house worker, reported missing for over a year, was found stuffed in a freezer in the deserted apartment of the couple in Kuwait last February. The ruling, made during the first hearing, in the absence of the defendants, Nader Essam Assaf, a 40-year old Lebanese, and his Syrian wife, can be appealed. The Filipina woman’s death exasperated already frosty relations between Kuwait and the Philippines over alleged ill treatment of tens of thousands of Filipino house workers in the Gulf country. Manilla had protested against the conditions and in January kicked off repatriation operations of thousands of its citizens willing to come back. Consequently, 4,000 have been flown out on government-sponsored flights and 6,000 are expected to leave pending amnesty by Kuwait City over violating residence regulations. Assaf and his wife ran away from Kuwait to Syria where they were arrested following a manhunt launched by Kuwait with the help of Interpol. The Lebanese man has been handed to Lebanese authorities. He appeared in a court last week and confessed to crime. He equally faces death sentence in his home country. His wife has remanded in prison in Syria. Posted by KanelkaTagba on Apr 2 2018. Filed under Gulf News, Headlines. You can follow any responses to this entry through the RSS 2.0. Both comments and pings are currently closed.